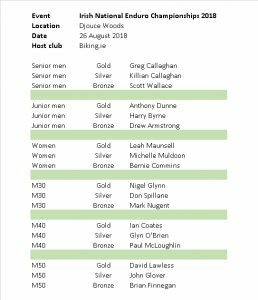 The first official Irish National Enduro Championships took place over the weekend of 25/26 August 2018 at Djouce Woods in County Wicklow. Hosted by Niall Davis and his team at Biking.ie the prestigious event is a reflection of the rise of enduro in Ireland. There are even upcoming plans for the UCI to recognise the sport internationally. The weekend was threatened to be overshadowed by the visit of Pope Francis to Dublin however, the top enduro riders in Ireland were focused on the 6 timed stages that they had to tackle. Saturday was for practice which saw dry trails but Sunday started with persistent rain which hung around until around 11 am. This left the trails very wet for race day but, as all riders had to face the same conditions, it meant that the challenge was stepped up for all and that everything had to come together right for them to reach the podium. 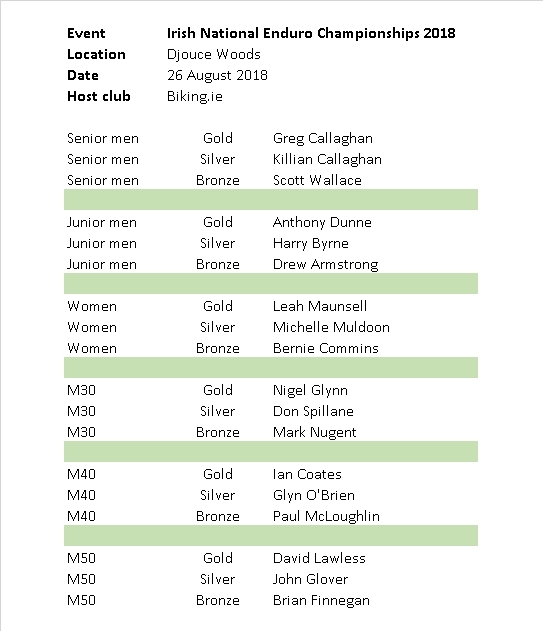 The current national championship categories are: Senior men, Women, Juniors, M30s, M40s and M50s however there were other support races on the day. The winners in the championships categories are shown below. Thanks to David Smyth from the Board of Cycling Ireland and to Paddy Fitzimons from Cycling Ireland for presenting the prizes. Many thanks to Niall, the Biking.ie crew and all the marshals and volunteers who helped to host this event. The next round of the Gravity Enduro series takes place on 8/9 September at Carrick, Co. Wicklow (details here).